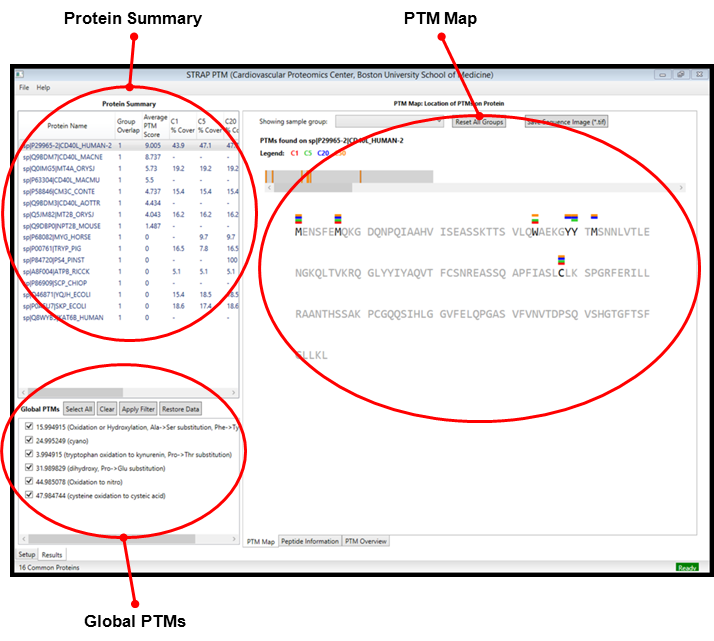 STRAP PTM (Software Tool for Rapid Annotation of Proteins: Post-Translational Modification edition) is a software program developed at Boston University School of Medicine (Boston, MA). The program characterizes PTM (post-translational modification) changes in large proteomic data sets obtained from liquid chromatography-tandem mass spectrometry (LC-MS/MS) experiments. STRAP PTM uses spectral counting and a novel scoring algorithm to accelerate the identification of differential PTMs through easy-to-use GUIs for setup and analysis. The program collates large data sets from two or more sample groups, identifies peptides with PTMs, and sorts and tallies the peptides and PTMs for comparison by protein and by group. STRAP PTM applies a unique, multi-component score to the PTMs for ranking at the amino acid, peptide, and protein levels. The results of STRAP PTM analysis are clearly visualized in many interactive tables and maps. Please select Download for the STRAP PTM program (version 1.0 beta) and the STRAP PTM tutorial sample files. Please select Tutorial for the STRAP PTM tutorial. Please select Quick Start for a basic guide in using STRAP PTM. Please select Contact Us for assistance with any STRAP PTM problems. STRAP PTM software was developed at the Cardiovascular Proteomics Center of Boston University School of Medicine (Boston, MA). The program (version 1.0 beta) is freely available for external testing. We assume no responsibility for its use, and we make no guarantees, whether expressed or implied, about its performance or any other characteristic. We would appreciate acknowledgment of our organization if the software is used. Jean L. Spencer, Vivek N. Bhatia, Amanuel Kehasse, Stephen A. Whelan, Christian F. Heckendorf, Catherine E. Costello, and Mark E. McComb, ASMS 2014, Baltimore, MD. Jean L. Spencer, Vivek N. Bhatia, Amanuel Kehasse, Stephen A. Whelan, Christian F. Heckendorf, Catherine E. Costello, and Mark E. McComb, ASMS 2013, Minneapolis, MN. Mark E. McComb, Jean L. Spencer, Vivek N. Bhatia, Stephen A. Whelan, Amanuel Kehasse, David H. Perlman, Christian F. Heckendorf, and Catherine E. Costello, ASMS 2012, Vancouver, BC. Jean L. Spencer, Vivek N. Bhatia, Amanuel Kehasse, Stephen A. Whelan, Christian F. Heckendorf, Catherine E. Costello, and Mark E. McComb, HUPO 2012, Boston, MA. Vivek N. Bhatia, David H. Perlman, Catherine E. Costello, and Mark E. McComb, ASMS 2011, Denver, CO.